One group that has a yearly share in the Hampshire CSA is Hampshire’s Early Learning Center. Each week, children come to collect the share–if you’ve ever wondered why there are tiny shopping carts in residence at the CSA barn, here’s your answer! 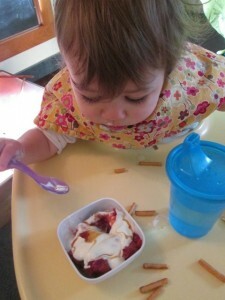 Casie Smith, the Early Learning Center’s director, sent along some photos of her charges enjoying their share. At the Early Learning Center, the weekly farm share plays an important role in both nutrition and learning for children ages 2 months to 5 years. 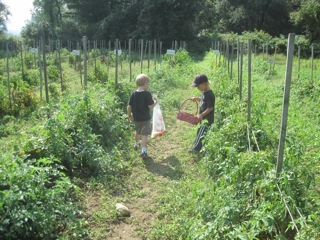 Every Tuesday afternoon, a small group of preschoolers make the long walk to the farm to retrieve the Center’s share of vegetables and herbs. 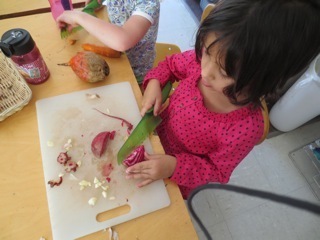 Throughout the week, children explore the vegetables in a variety of ways. 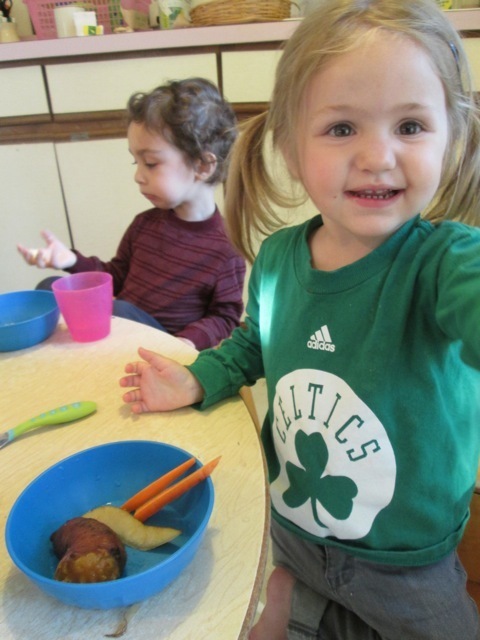 Vegetables are opened up and investigated in sensory tables; herbs and stalks are used for painting in the art studio; and older preschoolers develop a sense of communal responsibility by cooking meals for the infants and toddlers. The farm food plays many roles for our infants. Nutrition is certainly primary, but we also encourage them to explore the texture, taste, and smell of each new item. We often first introduce a new food in our sensory tub, allowing the babies to participate in the work of food preparation. 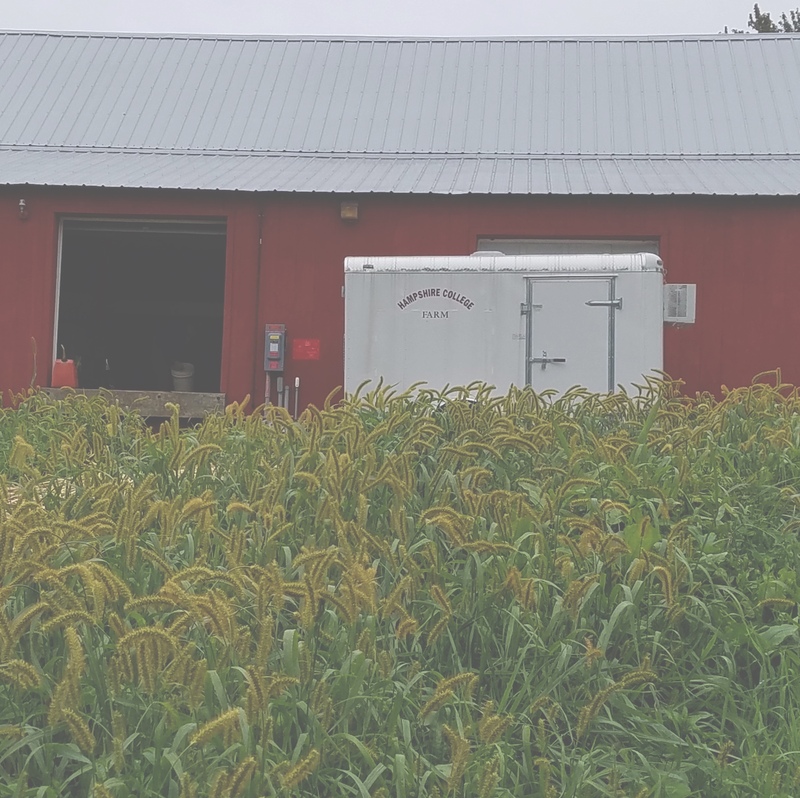 We routinely offer small portions of our farm share ingredients with common favorite foods such as mixing pureed squash or beets with yogurt or cream cheese. We frequently discover that new eaters are excited by strong flavors that wake up the whole palate. For toddlers and preschoolers, certain items, like baked kale chips (with oil, salt, and garlic) and julienned steamed and crunchy carrots are gobbled up immediately. The carrots provide exciting opportunities for teething children and make a fantastic scooping object for hummus to hungry mouths. Our crock-pot has been useful as a way to use up farm share items in soup. We sprinkle some dried herbs, defrost tomato sauce that was created from late summer’s tomato bounty, and add an assortment of veggies and greens to the pot for a nourishing soup for children, college students, and teachers to enjoy. 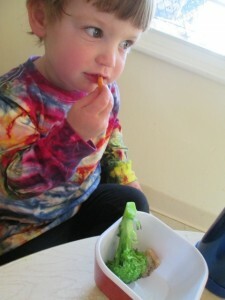 Admittedly, farm fresh veggies are not always the first snack choice for all young children. In the challenge of bringing farm veggies to wary children, we first offer only the most adventurous items in small quantities in each child’s dish. We sit with the children and eat along with them, hoping to at least give everyone a chance to try the new item, before supplementing either a dip or a favorite snack food. Our goal is to expose the children to a variety of textures and tastes and to present vegetables in a positive way, encouraging children to develop a deeper understanding and appreciation for where their food comes from and for the inherent beauty in the natural world. Sweet potatoes: mashed, baked, roasted, and seasoned as fries. Mix all ingredients together in crock pot set to high for 4 hours. Remove cinnamon stick and cardamom pods before serving.